“What if KRAFTWERK had begun not in 1970, but today, with all of our current technology? What would they sound like? The answer to that is SOMA! !” – Dave Thompson, ALTERNATIVE PRESS. SOMA is a diverse amalgamation of seemingly incompatible yet consumer friendly techno / reggae / digital / Spaghetti Western / wimpy ambient / analog / industrial / new age / organic / zippy / flaky influences. “Hollow Earth” has 13 tracks, is over 74 minutes in duration and sounds savagely contemporary. SOMA secretly likes to be different. 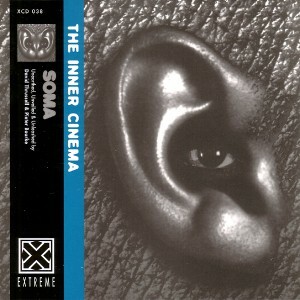 SOMA is a collaboration between David Thrussell and Pieter Bourke of Australian obscurities and international neophytes SNOG and BLACK LUNG. “Like KRAFTWERK before them, SOMA relentlessly experiment with sound, but like the best of KRAFTWERK (say Man Machine-era), it is instantly accessible. SOMA is the electronic music of the future.” – Dave Thompson, ALTERNATIVE PRESS. Formed and Deformed in THE CRYPT & AREA 51, 1993/94. Musik Data by Pieter Bourke & David Thrussell. Thanks to Valerie, Jules, Julianna, Jolly Roger & Admiral Bird. No Thanks to NASA for pulling the plug. All tracks digitally mastered by David Thrussell and Rick O’Neil at APOCALYPSE.